Sometimes I really don’t know how I got here. 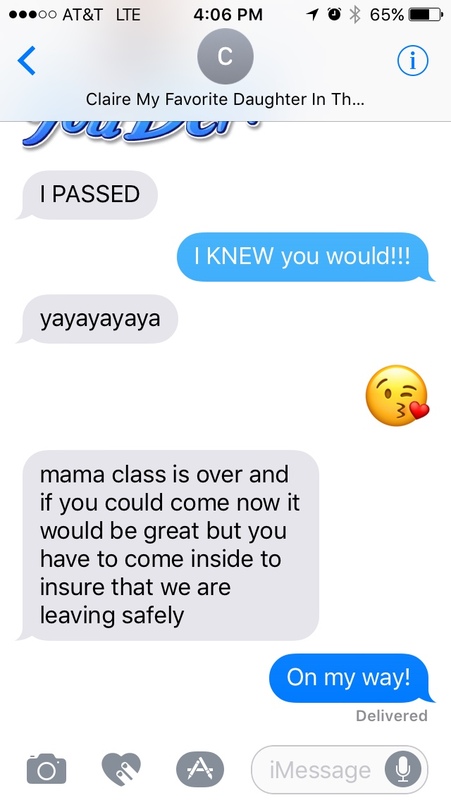 Today was Claire’s very last day of class room driver’s ed. She’ll start behind the wheel in a couple of weeks, and not long after that she’ll be a fully licensed driver, free to roam about the streets of RVA…at least to places we allow her to go. Anyway, that’s really not where I’m going with this blog. I’m not planning to wax poetic about the fact that the baby of my babies is now almost old enough to handle being behind the wheel of a multi-thousand pound weapon. Nor am I planning to lament and whine and cry about time passing so quickly. As I was walking into pick her up, I caught a glimpse of my self in the window. I don’t look like someone who should be trusted with ensuring somebody else’s safety. Today, I got a glimpse of myself from waaaay back when. And I couldn’t believe that I should be the trusted adult. How the heck did I get here? I feel like it wasn’t all that long ago I was the teenager waiting to be picked up. There have been many days in the time of parenthood where I have wondered how the heck someone else would trust me with another human’s life.. Like all three times the hospitals have sent me home with helpless newborns. What the heck did I ever do to earn that kind of trust? Or anytime I have had to sign medical papers allowing doctors to work on my kiddos? I should have no say in anything relating to the medical realm. Or today, when I was the trusted adult. The one who had to walk into a a building to check Claire out of class. How did I get to be the trustworthy one? I still feel like a kid in my own right. Today, feelings of fraudulentness kicked into high gear. Today, I pictured myself masquerading as an adult. Trust me? Ack! I’m just fumbling and bumbling my way through parenthood, hoping beyond hope I don’t screw my kiddos up too much. Trust me, that’s one thing I really don’t want to do!